Do you understand your market share? How do you find new market share? Should you grow existing markets? What research do you need to do? What is happening in the global market that might affect your business? Should you add new products or services to your business? Should you expand existing products or services? What expertise do you have in your business now? What unused assets might be sold? What equipment do you have? How do you manage change? How will change affect your company? What strategies do you need to employ to manage change? What training might be needed? 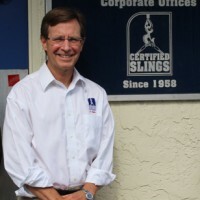 - Doug Worswick, CEO - Certified Slings, Inc.